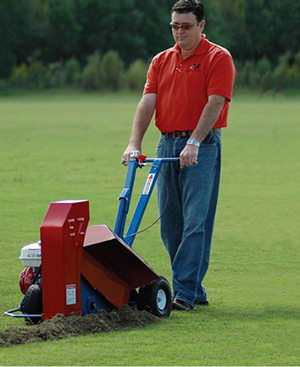 The Groundsaw model EZ9100 was built for durability and performance. It has a centrifugal clutch drive that is bathed in oil, which provides protection against extreme conditions and abuse. 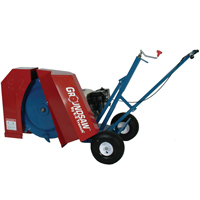 The Groundsaws are the fastest digging small trenchers on the market. Carbide bits cut right through tree roots and hard soils with our progressive biting blades. It is simple to use, not Intimidating to novice users, and small enough to get through fenced/gated back yards. The EZ9100 is great for Irrigation, LP/Propane Gas Lines, Low Voltage Electrical, Drainage, Root Pruning, and Silt Fence (erosion barrier). Rate of Cut: Approximately 100′ in 5 minutes (subject to soil conditions). Progressive Cutting Carbide Blade: Cuts hard soils and tree roots (Replaceable heavy-duty carbide bits are very durable). Neat & Clean Trench: 2.5″ wide trench from 0 to 13″ deep. Durable Wet Clutch: Absorbs sudden impacts and lessens belt wear; resulting in lower maintenance and more productivity. Engine: Honda GX200 (6.5hp) – It provides ample power and torque for trenching in tough conditions. Weight: 250lbs – Easily loaded and transported without having large trucks or special trailers.